Whisk together the ingredients for the sauce (sesame oil, soy sauce, maple syrup, chili garlic sauce, peanut butter) until creamy and smooth. 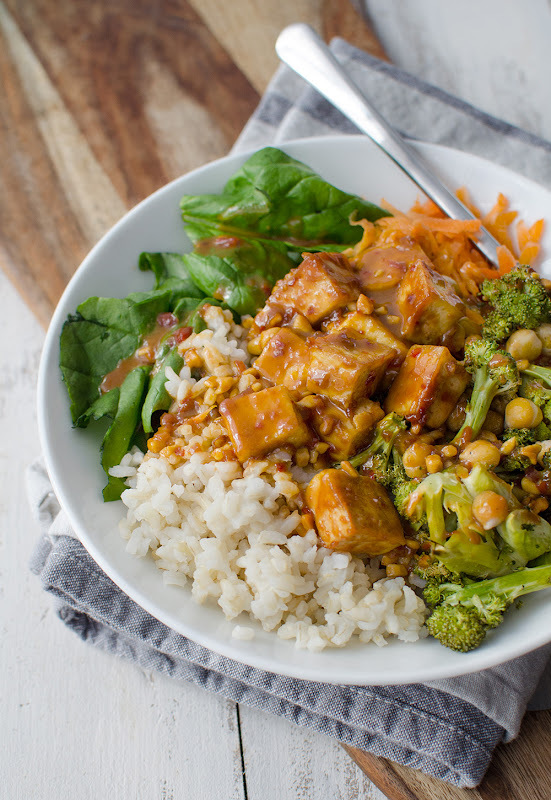 Add ½ of the sauce to the tofu bowl and let marinate while you prepare the rest of the ingredients. To assemble, divide the brown rice among 4 bowls, top each bowl with ¼ cup shredded carrots, ½ cup spinach leaves, ¼th broccoli, ¼ cup garbanzo beans and a few pieces of tofu. Drizzle with remaining peanut sauce.